Move Bar - Motivates you to be active throughout the day by displaying a red move bar after one hour of inactivity. Additional segments light up for every 15 minutes of inactivity. Just walk for a couple of minutes to reset. 24/7 Wearable - Stylish, comfortable and water resistant2 wristband that is always on and ready to go. Long battery life - Stays on for more than a year without having to change the battery. Easy-to-read display - View the time of day and your stats right on your wrist. Achieve your goals - Vivofit learns your activity level and assigns a personalized goal each morning. Count calories - Records calories burned throughout the day including base metabolic rate. Monitor your sleep - Set the sleep mode when you go to bed to track the quality of your rest. You already know the active steps you take now can improve your overall wellness today, tomorrow and well into your future. And while it seems simple to get out of that chair more often and move, making it stick is another matter. That’s where vívofit can turn good intentions into lifelong habits. It’s the only fitness band that greets you with a personalized daily goal, tracks your progress and reminds you when it’s time to move. vívofit learns your current activity level, then assigns an attainable daily goal. As you meet your milestones, vívofit will adjust your goal for the next day, gradually nudging you toward a healthier lifestyle. 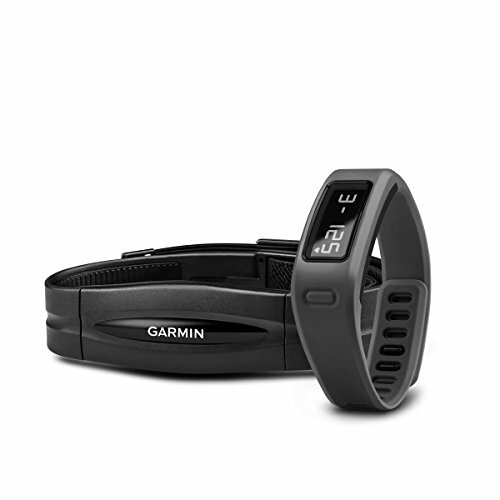 At Garmin Connect™, our free online fitness community, you can earn virtual badges and view your progress. Research shows prolonged periods of inactivity such as sitting at a desk decreases your body’s production of fat-burning enzymes. You can reverse that effect by taking frequent, short walk breaks throughout your day. And while you might lose track of time and forget to move, vívofit knows. A red move bar appears on the display after 1 hour of inactivity and builds when you’ve been sitting too long. Just walk for a couple of minutes to reset the move bar. When you’re ready to take the next steps toward better health, vívofit has additional features to keep you motivated. Use a heart rate monitor¹ with vívofit to record your heart rate and zone data and get more accurate calorie burn information for any fitness activity, such as a run or a cardio class at the gym. At Garmin Connect, you can join online challenges with other vívofit users or start your own competition with friends to compete for virtual badges and bragging rights. vívofit follows your progress 24/7, and it can stay on for more than a year without a battery change. Set the sleep mode when you go to bed and vívofit will monitor your rest. At Garmin Connect, you can see your total sleep hours as well as periods of movement and restful sleep. The vívofit band is water-resistant², so you can shower or get caught in the rain, worry-free. With the touch of one button, you can wirelessly sync vívofit with Garmin Connect to see a complete picture of your progress, join online challenges and earn virtual badges for extra motivation. You can access our free online community from your computer or on your compatible mobile device³ with the Garmin Connect™ Mobile app. ¹Included with some models, sold separately on others. ³Includes Bluetooth® Smart Ready phones; contact your provider to verify if your phone is compatible. The Bluetooth® word mark and logos are registered trademarks owned by Bluetooth SIG, Inc.